Tonight, youâ€™re gonna have yourself a real good timeâ€? 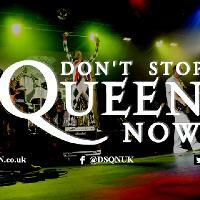 Donâ€™t Stop Queen Now is the North of Englandâ€™s finest tribute to the music of Queen. With this smash hit show, relive the magic of Queen or discover it for the first time as they play all of the hits such as â€˜Bohemian Rhapsodyâ€™, â€˜We Are The Championsâ€™, â€˜We Will Rock Youâ€™ and of course, â€˜Donâ€™t Stop Me Nowâ€™. â€˜Break freeâ€™ into a night of all these hits and many more, together with a couple of rare classics from their back catalogue; Donâ€™t Stop Queen Now will honour the legacy and music of the nationâ€™s favourite band. Donâ€™t Stop Queen Nowâ€™s many yearâ€™s playing experience and their inspiring attention to detail provides a truly authentic sounding experience. With a dynamic stage show combined with superbly crafted harmonies and electrifying guitar work, youâ€™ll be left going â€˜Gagaâ€™ for more!